Gather your friends and prepare for adventure in a remote alien planet! Whether you're new to roleplaying games, or just new to FAITH: the Sci-Fi RPG, this Starter Set is the perfect starting point. This box allows you to get started right away, with a learn-as-you-go scenario you can read aloud at your table. Crack it open and get started within minutes! Pre-generated character folios keep your character's information right at your fingertips, while the player deck system, and the gear and non-player character cards keep you immersed in the story and allow you to manage your luck. The complete rules will allow you to design your own adventures and continue to play with your characters once you finish your adventures in Ujara. The FAITH: A Garden in Hell Starter Set features a complete campaign for at least 7-12 gaming sessions that will take you to Ujara, an alien planet infested by Ravagers. As a brave member of the Coalition, your task is to not only defeat them, but extract enough information to turn the tides of the battle for the universe. Do you have what it takes? 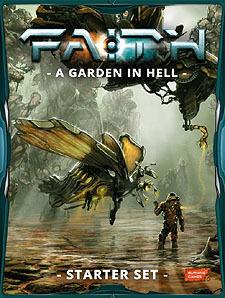 FAITH: A Garden in Hell is a completely standalone experience for 2-5 players.